Join us Friday, Nov. 4th for the competition of the year! 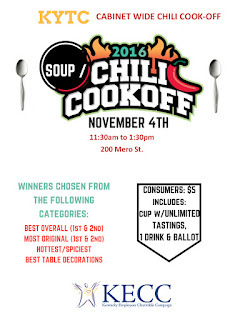 KYTC is holding a cabinet-wide KECC chili cook-off on Friday November 4th (11:30am to 1:30pm), and you're invited to be a judge! The KYTC office versus office competitors are in it to win it, so judges are in for a real treat. Everyone is invited to be a judge for just $5.00. This includes one cup with unlimited tastings, 1 drink & ballot. Weather permitting, the chili cook off will be outside, behind the KYTC building (200 Mero St.) on the east side.